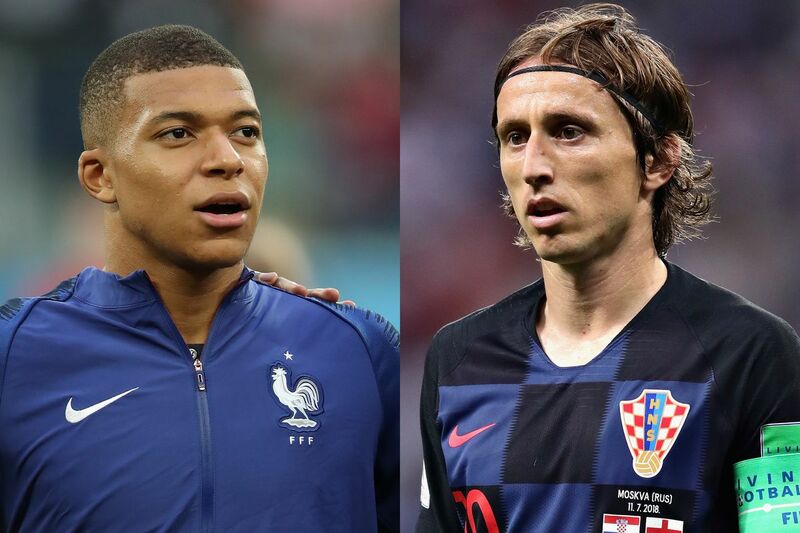 France's Kylian Mbappe and Croatia's Luka Modric will face off in the World Cup final. A World Cup of surprises concludes with a final of contrasts. Powered by the dynamism of Kylian Mbappe, France has youthful exuberance in a side packed with some of the game's most expensive talent. It also has pedigree－winners in 1998 and finalists in 2006. Croatia has a veteran roster that has been stretched to the limit but continues to win in Russia. The Croats never give in, prevailing in a shootout against Denmark, again on penalties against Russia－after being stung by a late equalizer－and then recovering from conceding early against England. Just don't suggest Croatia will be weary when it returns to Luzhniki Stadium for Sunday's final. Star midfielder Luka Modric said "we will see who will be tired" was the team ethos going into Wednesday's semifinal, feeling Croatia had been underestimated by the English. Modric, along with Mario Mandzukic, are the 32-year-olds who have led Croatia to its first major final. In the previous four World Cups, it failed to qualify in 2010 and was ousted in the group stage the other three occasions. Before that, in its World Cup debut in 1998, Croatia reached the semifinals, where it lost to France. When Croatian Prime Minister Andrej Plenkovic visited the team hotel in Moscow on Wednesday that 1998 game was on his mind－even before beating England. "We might have the chance for the revenge in the finals with the French," Plenkovic said. Croatia advanced to its first World Cup final with a 2-1 extratime win over England on Wednesday night. France beat Belgium 1-0 on Tuesday. "We have a good opportunity to give them something back for 20 years ago when they reached the final," Croatia defender Dejan Lovren said. "Maybe it's our time to revenge something but it's a tough game and it will be difficult." A country of 65 million, France boasts stars like 19-year-old sensation Mbappe, midfielder Paul Pogba and striker Antoine Griezmann. Croatia is the fourth-smallest country of the 32 World Cup teams with just over 4 million people. It has a chance to be the least-populous nation to win since Uruguay took the title in 1950, when it was a nation of just over 2 million.